When Open Ears wanted to animate the Cube in City Hall with a reel of GIFs that would tie-in to our festival theme - ReReRe - we immediately appealed to Karie Liao, former artistic director of CAFKA, for help in creating something weird and wonderful. Take a moment during the installation dates to look up and see something you've never, ever seen before. People of the Future is a curated series of GIFs inspired by synesthesia, a condition in which the response of one sense is met with the experience of another; “feeling” images, “smelling” sounds, or “tasting” colours. This GIF reel is comprised of recent and new works by Jennifer Chan (Toronto), Clint Enns (Toronto), Winston Hacking (Toronto), Alison S.M. Kobayashi (Toronto/New York), Jodie Mack (Chicago/Vermont), and Phillip David Stearns (New York). Although these artists have practices with distinct styles and processes, their work often incorporates found materials, animation, video, film, and new media, and shares the strong characteristic of heightened visual and visceral tactility. Winston Hacking and Jodie Mack employ handmade and analog animation techniques in their GIFs that mimic the characteristics of modern technology. Similarly, Alison S.M. Kobayashi’s GIFs incorporates retro technology but focuses on the hidden narratives found in these discarded objects. Like the other three artists, Jennifer Chan and Clint Enns are cultural scavengers. They appropriate found imagery and employ amateur aesthetics to create GIFs that critique media conventions and Internet culture, conjuring mixed feelings of suspended disbelief, nostalgia, humour, and discomfort. Phillip Stearns’ featured work is an investigation of computerized vision and behavior. His GIFs resonate with natural cyclical processes and anthropomorphic qualities that evoke a sense of familiarity and synchronized rhythm in the viewer. 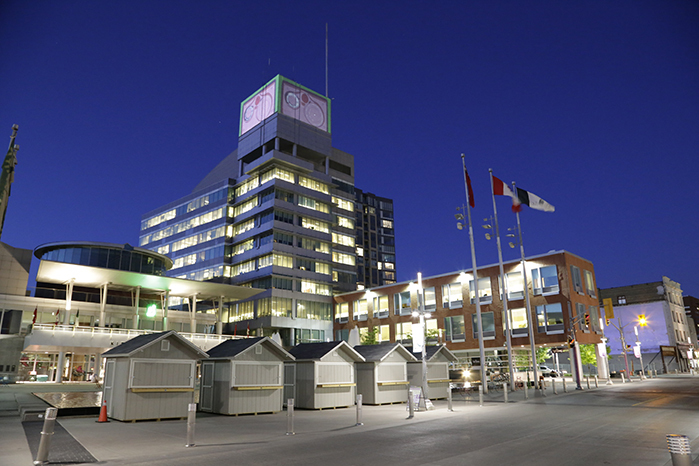 These visually affective and engaging GIFs will be exhibited on The Cube, an immense two-sided projected surface located high atop Kitchener City Hall. The Cube can be seen for miles. This GIF reel will provide much-needed creative visual excitement in the current day-to-day landscape of ubiquitous mundane commercial digital imagery. In some sense those who experience synesthesia can be considered “people of the future” as they are able to experience reality in more forms than the average person. In our current digital age, saturated with sound and imagery, this series of GIFs may stimulate onlookers’ intuition and articulate a hypothetical future, in which we are all synesthetes experiencing our surroundings in an even more complete way. JENNIFER CHAN (Toronto) is an artist who makes remix videos, GIFs and websites that contend with the confused messages of race and gender in media culture. Her work often involves decontextualized online imagery that reflects and remixes the accelerated attention spans created by the online environment. Her kitschy remix videos resonate with her active and irreverent engagement with social politics and qtwoc (queer/trans/women of colour) feminism on the Internet. Chan has had solo presentations at Western Front (Vancouver), Transmediale 2013 (Germany), Future Gallery (Berlin), The Nightingale (Chicago), Images Festival (Toronto), Vox Populi (Philadelphia), LTD (Los Angeles) and Galleri CC (Malmo). Her work has been featured in Art Forum, Rhizome, Leap, Furtherfield, Sleek Magazine, and Dazed Digital. She recently produced commissions for Artslant, Mexico Projects and Kunsthaus Langenthal. For Open Ears, Chan will exhibit Cam Twist (2013) and Desperate (2015), two GIFs that are self-portraits for the artist but also act as a metaphor for mainstream perceptions of self-representation in the Internet age. Cam Twist depicts a distorted moving image of the artist, which serves as Chan’s critique of “selfie” culture and exploration of meaning behind her own digital reflection. Desperate is the result of an image search for “idealized masculinity” by the artist for a recent video project. During that search she found a stock image that illustrated her failed heterosexuality; a “3D rendering muscle man hugging woman from behind.” Chan sympathized with the muscle man in the image and saw herself reflected in him. CLINT ENNS (Toronto) is a video artist and filmmaker. His work primarily deals with moving images created with broken and/or outdated technologies. His work has shown both nationally and internationally at festivals, alternative spaces and micro-cinemas. Enns’ work critiques vision and encourages different ways of seeing. He often employs retro technology to abstract, echo, and remix images, some of which are taken from his own cameras, others from video games and online sources. Through de-contextualization Enn’s obscures familiar imagery and the logic of media conventions. He has had solo retrospectives in Winnipeg, Brooklyn, Austin, and Ottawa. Enn’s holds a Master’s degree in mathematics from the University of Manitoba, and has recently received a Master’s degree in cinema and media from York University where he is currently pursuing a PhD. For Open Ears, Enns will create new work. His GIF is informed by past work including Let Me ASMR You (2014), a rhythm study using ASMR (Autonomous Sensory Meridian Response) inducing sounds from videos found on Youtube. Though silent, Enns’ GIF for The Cube will use found and familiar imagery to create an intimate yet uncanny, multi-sensory experience for the onlooker. WINSTON HACKING (Toronto) is a mixed media artist, filmmaker, and art director best known for his work with stop-motion animation, puppets and miniatures. He is invested in exploring new mediums while paying tribute to the innovations of the past. Working in mixed media, Hacking has produced dynamic workshops and interactive content for TIFF Bell Lightbox, The Royal Ontario Museum, the History Channel, and TVO, all of which combine classic animation techniques with new technology. In the past, Hacking has directed many memorable music videos for a number of renown Canadian musicians including Timber Timbre, Austra, and One Hundred Dollars just to name a few. His work has garnered millions of views online and has been featured on television (Much Music, MTV) as well as on art and culture blogs (Boooooom!, Vice, Rolling Stone, New York Times). Over the past 2 years, he has also worked closely with Taqqut Productions in Iqaluit, creating sets for television pilots and assisting the development of their art department. In 2013, he was the assistant art director for the stop motion unit of the feature film The Little Prince released in 2015. He is currently collaborating with filmmaker Brett Long on a stop motion animated virtual reality experience funded by the Canada Arts Council. For Open Ears, Hacking has proposed to create new work entitled Forced Reps. This project is an attempt to mimic the looping characteristic of a GIF through analog, physical movement. Hacking will create "paper-teered" GIFs by moving collaged images by hand. He will move these collages with a repeated motion simulating a loop. The repeated action is precise at first but eventually as his hands tire, the illusion of the loop is broken and the collage falls apart. This “analog GIF” is homage to traditional forms of animation but also a test of endurance for the artist. JODIE MACK (Chicago/Vermont) is an experimental animator who received her MFA in film, video, and new media from The School of the Art Institute of Chicago in 2007 and currently teaches animation at Dartmouth College. Combining the formal techniques and structures of abstract/absolute animation with those of cinematic genres, her handmade films use collage to explore the relationship between graphic cinema and storytelling, the tension between form and meaning. Musical documentary or stroboscopic archive; her films study domestic and recycled materials to illuminate the elements shared between fine-art abstraction and mass-produced graphic design. Questioning the role of decoration in daily life, the works unleash the kinetic energy of overlooked and wasted objects. Mack's 16mm films have screened at a variety of venues including the Images Festival, Ann Arbor Film Festival, Rotterdam Film Festival, Edinburgh International Film Festival, and Views From the Avant Garde at the New York Film Festival. She has presented solo programs of her work at venues such as the Anthology Film Archives, Los Angeles Filmforum, REDCAT, and the BFI London Film Festival. She has also worked as a curator and administrator with Dartmouth's EYEWASH: Experimental Films and Videos, Florida Experimental Film and Video Festival, Portland Documentary and Experimental Film Festival, Eye and Ear Clinic, Chicago Underground Film Festival, and The Nightingale. She was a featured artist at the 2011 Flaherty Seminar, and she’s the 2013 recipient of the Marion McMahan Award at the Images Festival. For Open Ears, Mack will create a new GIF that echoes her past works including Film Still (33) -Unsubscribe #3: Glitch Envy (2010, 16mm, 5m45s, colour, sound), an experimental animation the uses junk mail detritus to create a handicraft salute to new media. ALISON S. M. KOBAYASHI (Toronto/New York) is an identity contortionist. In her work, Kobayashi performs a variety of characters that are both studiously and playfully rendered. These personas are inspired by Kobayashi’s extensive collection of lost, discarded and donated objects; ranging from answering machine tapes purchased at a secondhand shop to a love letter left on a sidewalk. Through repeated interaction with the objects — deep listening, research, re-enactment and play — narratives and imagery begin to manifest and inspire new work. The results are funny, low-fi artifacts of an artist embodying the lives of others. Kobayashi’s short videos have been exhibited and screened widely in Canada, the United States and overseas. She was a guest artist at the 2008 Flaherty Film Seminar and her body of work was a Spotlight Presentation at Video Out, Jakarta International Film Festival, Indonesia and is a 2016 MacDowell Colony fellow. In 2012, she was commissioned by Les Subsistances in Lyon, France to produce her first live performance, Defense Mechanism. Alison S. M Kobayashi was born in Mississauga, Ontario and is based in Toronto and Brooklyn, NY where she is the Director of Special Projects at UnionDocs, Center for Documentary Art. For Open Ears, Kobayashi will create new work. The artist’s proposed GIF is based on the now defunct mid-century audio recording device called a wire recorder. Over the past year she has developed an installation and performance based on two reels hidden inside one of these machines, which was purchased at an estate sale in New York. The recordings capture the voices of a New York family spanning 1952 to 1954. The narrative contained in the recording is a puzzle peppered with fragmented and overlapping dialogue, a charming living room drama rich with the eccentricities of family dynamics performed for the tape recorder. Decoding the document and using it as both soundtrack and inspiration, Kobayashi has created a new installation containing videos, drawings and a book work that reimagine the events, characters, and references from the recording. Kobayashi’s new GIF for The Cube will be a part of this greater body of work. I work with electronic technologies and media as tools to explore dynamic relationships between ideas and material as mobilized within complex and interconnected societies. Deconstruction, reconfiguration, and extension are key methodologies and techniques I employ in the production of works that range from audio visual performances, electronic sculptures, light and sound installation, digital textiles, and other oddities both digital and material. I received my MFA in music composition and integrated media from the California Institute of Arts in 2007 and BS in music technology from the University of Colorado at Denver in 2005. My work has been exhibited internationally at electronics arts festivals, museums, and galleries including: SCAD Gutstein Gallery (2015), Tate Britain (2014), Turku Biennial (2013), WRO Biennale (2013), Transmediale (2013), Denver Art Museum (2013), The Photographer’s Gallery London (2012), The Camera Club of New York (2012), Eyebeam (2012, 2007), Harvestworks (2010, 2012), Gli.tc/H 2112 (2012), Festival De Arte Digital (2010), FILE (2009), NIME (2009), Filmer La Musique (2009),Torrance Art Museum (2008, 2007), Optica Film Festival (2011 & 2008). I've has participated in residencies at the Making Lab of the 4th APAP ( Korea 2013), Textielmuseum in Tilburg, NL (2013), Institute for Electronic Arts (2012, 2013), Museums Quartier (Vienna 2010), STEIM (Amsterdam 2007, 2013), Experimental Television Center (2009), Harvestworks (NY 2010), Free103Point9 (2012). I've presented and led workshops at several international institutions including the Athens Video Art Festival (2014), Universidad De Chile (Santiago 2013), Santiago Maker Space (2013), Pomona College (2013), Recyclism Hacklab (Dublin 2013), and the Science Gallery (Dublin 2013). Karie Liao (B.A., 2008, Art History and Cultural Studies, McGill University; M.A., 2011, Art History and Curatorial Studies, York University) is a community-driven contemporary art curator based in Toronto and Cape Breton. Currently, she is the Curator at Cape Breton University Art Gallery (Sydney, NS). In the past, she has held the position of Resident Curator at Artscape Youngplace (2014-2015), organizing contemporary art projects, including exhibitions, artist talks, publications, and artist-community collaborations. From 2013-2014, she was the Artistic Director of Contemporary Art Forum Kitchener and Area where she worked alongside Executive Director Gordon Hatt and the CAFKA Committees to organize CAFKA.14, a biennial exhibition of large-scale art installations in atria, storefronts, parks and other public spaces throughout Kitchener and the surrounding region. Artists include Krzysztof Wodiczko, Mary Mattingly, Robert Seidel, Seripop, and Steve Lambert, among others. As Curatorial Resident at the Textile Museum of Canada (2013-2014), she worked with Executive Director Shauna McCabe and the curatorial team, and curated the exhibition “Wanderlust,” featuring work by Jordan Bennett, the Color Collective, and NorBlack NorWhite. She has completed internships at the former Jessica Bradley Inc. (Toronto, ON), Creative Time (New York, NY), Deitch Projects (New York, NY), the former Liane and Danny Taran Gallery of the Saidye Bronfman Centre for the Arts (Montreal, QC), and Dare-Dare – Centre de diffusion d'art multidisciplinaire de Montréal (Montreal, QC).